Difference between revisions of "STEM Model Creator"
Important Note: The instructions on this page require STEM 2.0 Milestone 3 or later. This document is currently being updated for changes in STEM 2.0 Milestone 3. Please check back as we document new features. 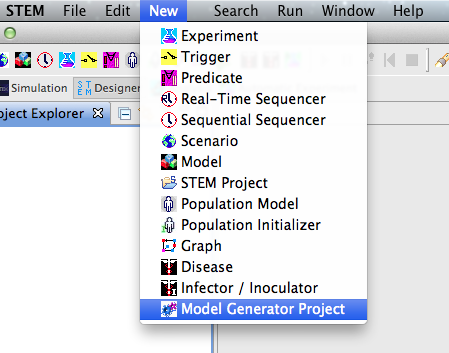 The model creator supports users who want to create a new disease or population model in STEM rather than use an existing model. Setting up the basic structure for a new model can be challenging. This tutorial provides step-by-step instructions for using the STEM Model Creator to design and generate the structure of a new STEM computational (disease/population) model project. Using a simple menu driven interface a user can define a new model (disease or population model) using terminology familiar to any subject matter expert. 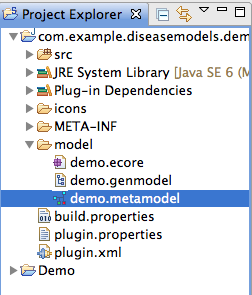 The model creator will then auto-generate the eclipse plugin and java code defining the model and hot inject it into the user's run time instance of STEM. 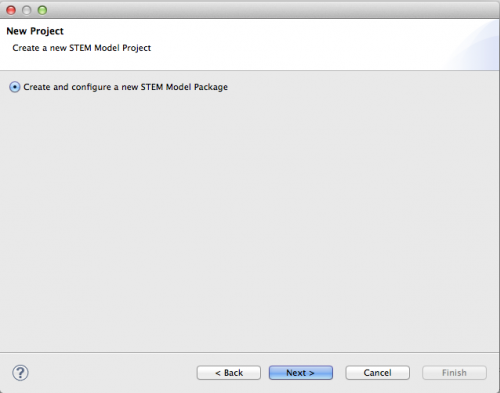 Beginning with STEM 2.0 Milestone 3, a new visual editor is now included as part of the STEM Model Creator. The development of the Model Creator tool was sponsored in part by the German Federal Institute for Risk Assessment (BfR). Additional special thanks to Alex Falenski from BfR for assistance creating and editing this document. 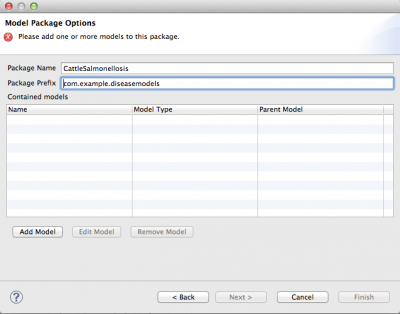 The model package is the container for all models in a given package. 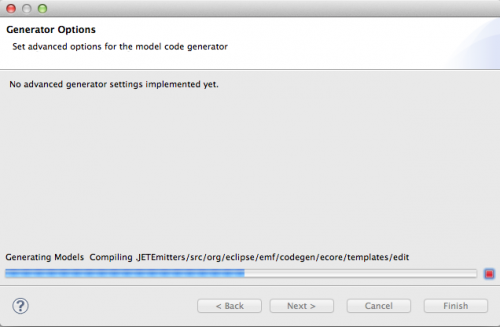 A model package generates an Eclipse plug-in project. The Package Name and Package Prefix are combined to create the resulting Eclipse plug-in/project identifier. 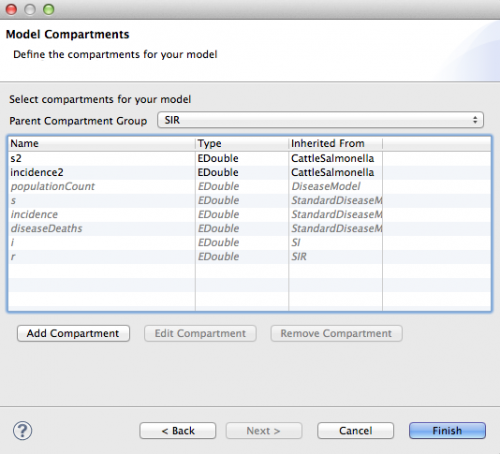 For example, the model package with values above will generate an Eclipse plug-in/project with ID com.example.diseasemodels.cattlesalmonellosis. This plug-in, once automatically generated, will be added to your STEM runtime (while it is running). Later we will explain how you can also send this plug-in to colleagues you wish to share it with. When you're ready to add a computational model to the package, from the Model Package page, click Add Model. To edit an existing computational model, select it in the Contained Models list and click Edit Model. This will launch the Computational Model Wizard. Model properties are the most basic settings of a STEM Computational Model. Properties include the model's name, the model's type, and which parent model it extends and inherits parameters and compartments from. All are required. 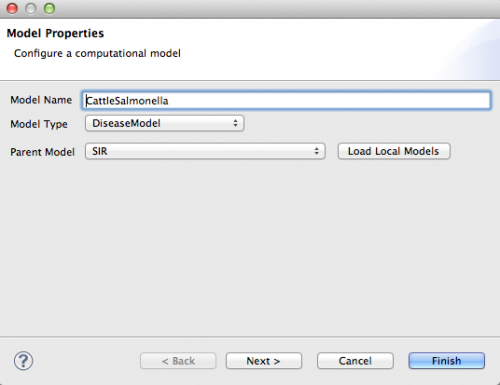 (Java Identifier) CattleSalmonella The model's name. This value will be the Java class name of the generated model. Should contain alphanumeric characters, no spaces, and cannot begin with a number. Model Type String from list DiseaseModel The underlying model type. 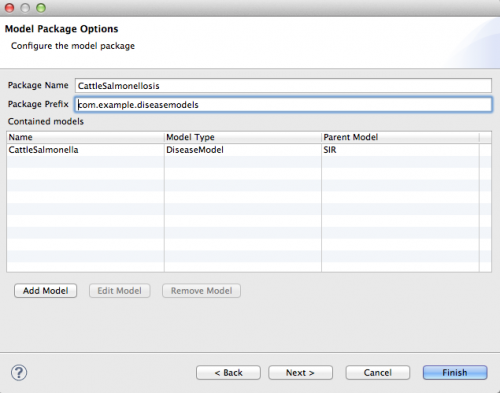 If you're implementing a Disease Model, select DiseaseModel. A Population Model, select PopulationModel. This value is used to find appropriate parent models. Model parameters - also called rate parameters - represent user-defined variables that are passed into the computational model. The values can represent many things, but are often variables to the differential equations that make up the model. Users are asked to provide values for these parameters when a new Disease/Population/etc is created in STEM. Examples include Transmission Rate, Immunity Loss Rate, etc. By default, a model inherits parameters from its ancestor models (which might be a model you already created using these instructions). These are shown in light gray italics. 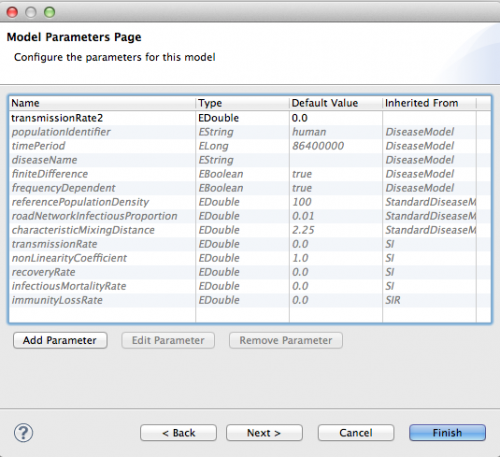 You cannot edit or remove parameters inherited from another model. So, if you don't want to use a parameter on the list, start with a higher level model. The most generic Disease Model has one state 'S' for susceptible and no parameters at all. 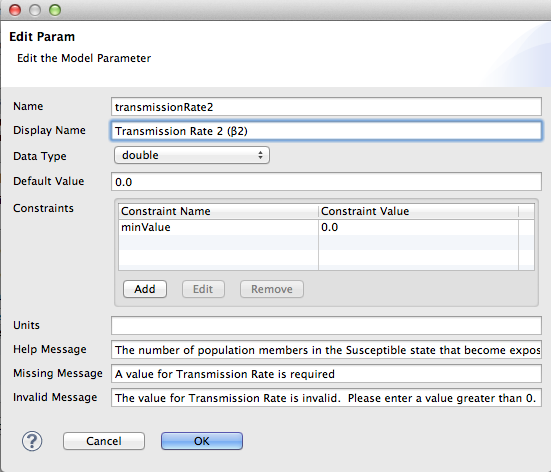 To add a new model parameter, click Add Parameter. To edit an existing parameter, select one from the list and click Edit Parameter. When you click Add or Edit Parameter, the Model Parameter Editor window opens. Use the form provided to set the properties for the model parameter. Name Yes String (Java Identifier) transmissionRate2 The parameter's name. This is the name of the Java member variable in the resulting computational model. This required property is a Java identifier and should contain alphanumeric characters, no spaces, and cannot begin with a number. Display Name Yes String Transmission Rate 2 The display name of the parameter. This should be a short, user-friendly description of the parameter. 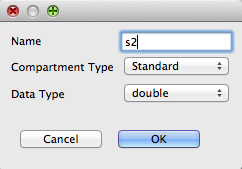 Data Type Yes EClassifier double The data type of the parameter. This will be the Java type of the resulting member variable. Tip: For models with multiple populations, select a ValueList or ValueMatrix data type. Default Value Yes** Type-specific 0.0 The default value of the parameter if a value is not provided by the user. A default value often accompanies the parameter in literature. **This field is required for numeric data types (like double, integer, float, etc). Constraints No Constraint minValue Parameter constraints are used to restrict the allowed parameter values. See below for more details about Parameter Constraints. Help Message No String User interface message that further explains the purpose or other details about this parameter. Missing Message No String User interface message that displays when no value is entered for this parameter. Invalid Message No String User interface message that displays when an invalid value (e.g. violates the constraints) is entered for this parameter. Parameter constraints are used to restrict the allowed values for a model parameter. A parameter can have multiple constraints. Each constraint is evaluated independently and must be fulfilled for a value to be accepted. Note: You can add multiple constraints of the same type. However, for certain constraint types, this may not make sense and may cause a value to never be valid. For example, it does not make sense to create two minValue constraints. To add a new constraint, click Add. To edit an existing constraint, select one from the constraint list and click Edit. Use the Constraint Editor to select the Constraint Type and enter a Constraint Value. When finished, click OK. When you're finished working with Model Parameters, click Next to configure Model Compartments. Model compartments are the second type of variable in the computational model and represent the various groupings within the model lifecycle. Unlike Model Parameters, however, these values are not defined by the user, but instead are calculated as the output from the model's differential equations. For more information, please read the Introduction to Compartment Models. Like Model Parameters, Model Compartments are inherited from the parent model. Compartments inherited from another model are shown in light gray italics and cannot be edited or removed. If the compartments from your parent model do not closely match the compartment model you're implementing, you can elect to choose a different model to inherit compartments from. Note: Just because a compartment does not match the compartment name in literature does not mean it's not logically the same or can't be reused. Consider this before deciding not to use an inherited compartment. To add a new compartment, click Add Compartment. To edit an existing compartment, select it from the list and click Edit Compartment. Use the Compartment Editor dialog to edit the compartment's properties. All properties are required.. When finished editing the compartment, click OK.
Compartment Name String (Java identifier) s The name of the compartment. This is also the name of the resulting Java member variable. It should contain alphanumeric characters, no spaces, and cannot begin with a number. Compartment Type String Standard The property of values stored in the compartment. This helps determine what kinds of underlying calculations occur. Example types are Standard, Incidence, and Deaths. 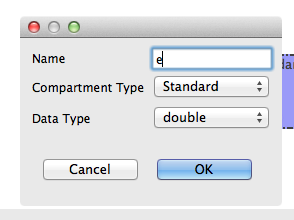 Data Type EClassifier double The data type of the compartment. Currently only valid type is double. When you're finished working with compartments, the model is complete. Click Finish. When you're finished working with the computational models in the model package, you're ready to run the code generator. From the Model Package page, click Next. 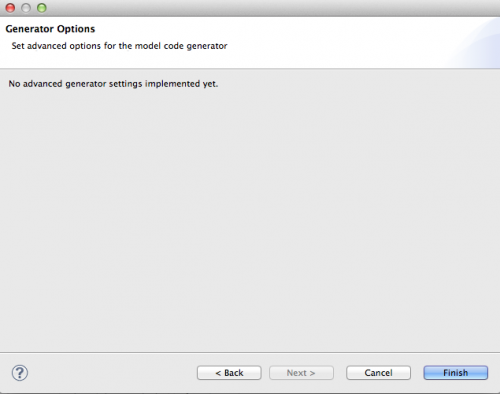 On the Generator Options, configure advanced properties for the code generator. Advanced Generator Options coming soon! If no errors are found, the code generator will now run. This process may take 1-2 minutes. After the initial Model Generation completes, your new model will open in the Visual Model Editor. You're now ready to begin defining the state transitions that describe your compartment model. See the next section for more information. 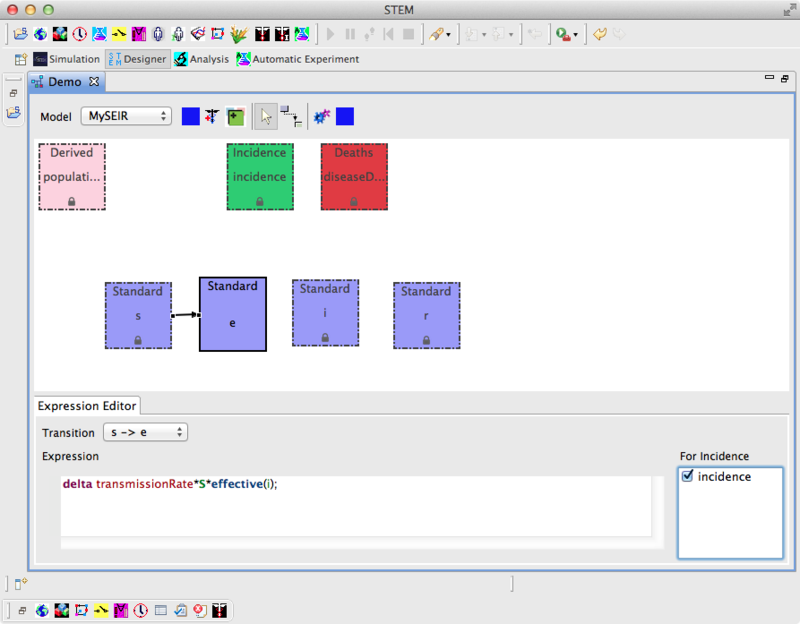 The STEM Visual Model editor is a new tool to scientists to describe the structure - and mathematics - behind their computational model in an easy to use graphical user interface. The Visual Model editor is a tool for visual designing compartment models. With the Visual Editor, a scientist can arrange the compartments in their model, draw transitions that describe the state transitions between compartments, insert the equations, and immediately run STEM simulations - without needing to restart. Automatic translation of expressions into Java code, compilation, and installation into STEM - without needing to restart! If you have just created a new model project, the Visual Model Editor should open automatically after the project is created. 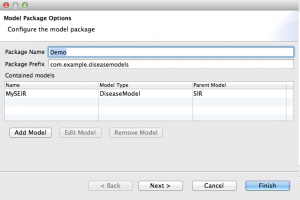 To add a new disease/population model to an existing metamodel, click the Add Model button in the Visual Editor toolbar. This will launch the Add Model wizard. For help with the Add Model wizard, see this section. After completing this step, be sure to re-run the Model Generator. Once a computational model is created, users can edit a model's parameters. This includes adding new parameters plus editing and removing existing parameters. Important: if you edit or remove a parameter, be sure to update all references to that parameter from your transition expressions. The model editor currently does not support this automatically. This will launch the Edit Model dialog. For help editing Model Parameters, see the Configure Model Parameters section. When finished, click OK to apply your changes or Cancel to discard changes. After completing this operation, be sure to re-run the Model Generator. This will launch the add compartment dialog. Enter a Name and select a Compartment Type . You can only edit compartments that owned by the current model. Inherited compartments are indicated with a lock icon in the box. 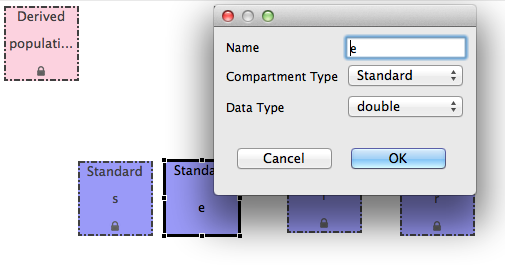 To edit an existing compartment contained in a model, select the Chooser tool in the Toolbar. Select the compartment to edit and double click. This will open the Edit Compartment dialog. Certain operations that change the "structure" of a computational model require a "Model Regeneration". This is a non-invasive operation that rebuilds several of the key Java files that make up a computational model project. It does not change the Java code associated with your expressions or change the project's metamodel in any way.